Soooo I’m trying this again! Yesterday, I offered these same images in PNG format as a Zip File. It seemed to be going pretty smoothly in the beginning, for most of you, until we hit some sort of Bandwidth limit. It looks like I will have to find some other more reliable way to share Zip Files, if you have a recommendation, please let me know! I need a way to share files, that has unlimited Bandwidth and that won’t charge or harass my readers into trying to pay something to download. I’m happy to pay a fee on my end, but I don’t want my readers to have to. Anyway, in the meantime, I’m offering this Christmas Collage Sheet Printable, with the same images. I’m crossing my fingers that the problem affecting the other download won’t carry over to this PDF file!! Regency Fashion Plate – Jane Austen-esque Beautiful Natural History Butterflies Printable! 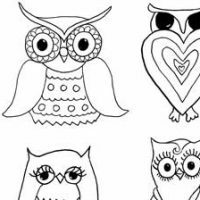 Free Owls and Mushrooms Coloring Page! Hey Karen! Sites like yousendit.com or sendspace.com are great ways to share huge zip files for free, Your site is awesome! thank you so much. You have the BEST vintage images. Thank you for sharing them with us!! I LOVE your site Karen! Thank you so much for posting all these amazing pictures! Sorry if this is the wrong place to post a request day request, but could you post some artist items please (paintbrushes, easels, an artist painting…anything arty). Thank you so much! Thank you Karen, I did have a little problem with the zip file, but today’s images downloaded perfectly as a JPEG. Although I have a separate folder for your images, it is growing by leaps and bounds. I check your site everyday! Luv you! Thank you for this vintage pictures !!! Thank you! Today’s version downloaded and printed perfectly. I didn’t even try yesterday’s because I didn’t understand the process.) For some reason, though, going to the open button on the computer and typing in the name of the print in the search bar did not locate it like is usually the case. But when I just opened the pictures file we have, it was first up. Thank you very much for your work and delicacy! I use these images because stan very nice! Thanks you guys, I’m glad this one worked better!! Joe, Thanks for the recommendations, I’ll check them out! 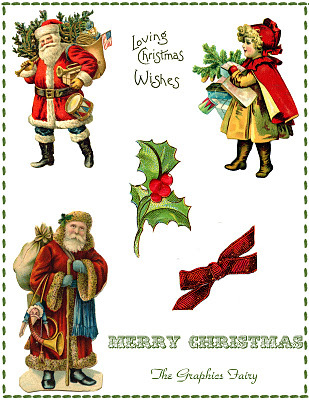 Thank you so much for the beautiful Christmas vintage images – they are lovely! Love the images.. I know I have issues with transferring files too.. I will look forward to seeing solutions! images… and think you do a fabulous job of making them as easy to download as possible!! Ah – but the zip download is working again tonight – just had to wait for time to pass. Thanks so much for these! Thanks for the vintage Santa collection. They’ll be used. Thank you so much Karen! I’m a digi gal, so pngs are ALWAYS welcome! But I’m good either way! It’s like asking for all you do on a silver platter too when we get a png from you! lol! That should be a Christmas card greeting! lol. Thank you, Karen! This time it downloaded without problems! Thank you so much Karen! I just love your downloads!!! This is such a beautiful Christmas Collage page!! Thank you very much for the wonderful vintage Christmas images! !